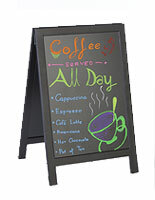 This Write On A-Frame Is In Stock Today! 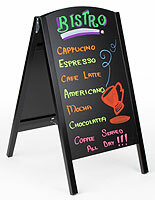 This Sign Can Be Used In a Number of Creative Settings to Display Sales, Menu Options and Event Information! 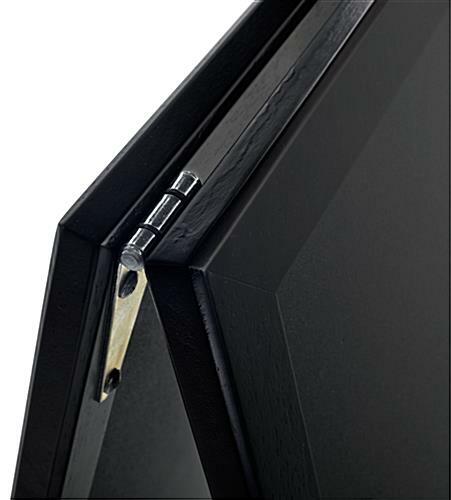 Shop the Catalog and Order a Write On A-Frame Now! 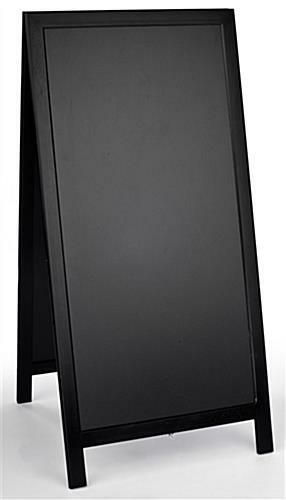 24" x 28" 24" x 36"
Double-sided black MDF display board attracts customers from both directions! Wet erase/liquid chalk markers wipe off easily with wet cloth! Hinge and chain keep sign from collapsing! Designed to fold flat for businesses with nominal storage! 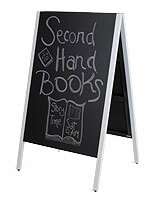 20" x 42" black wet erase writing surface for detailed advertisements. 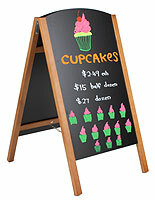 A write on a-frame, like this liquid chalk menu stand, is the best choice for quick signage changes! 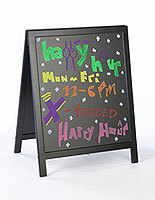 Restaurants, bars, salons, book and gift shops, convenience stores and many other types of retail corporations all use this foldable sign to bring new customers into their establishment. 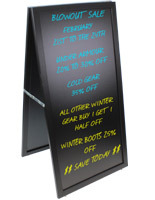 This tall sandwich board, write on a-frame that helps to promote daily specials to potential customers features a double-sided surface which is beneficial when trying to reach consumers traveling from both directions. 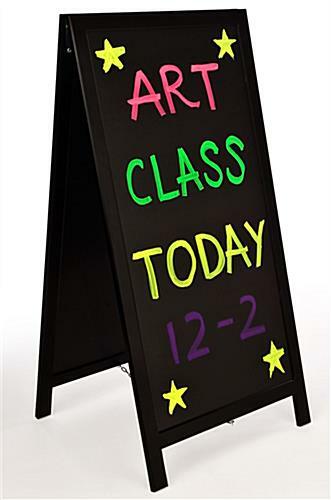 Sale information and other pertinent announcements can be resourcefully displayed on both sides, each panel contains a 20"w x 42"h area for drawing picture designs or inscribing messages! A write on a-frame that collapses to 2" wide and weighs only 26.5 lbs. 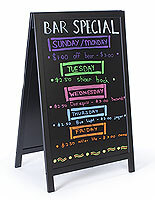 is an ideal purchase for any type of business that has minimal room to store away foldable signage. When collapsed, this menu holder measures 23-5/8"w x 49-3/8"h x 2"d, a reasonable size for small book stores and coffee shops to put in safekeeping when not in use! This write on a-frame that is intended for cost-effective advertising can be positioned and customized with a picture or drawing within seconds! Those who are in charge of designing messages on the board find that drawing on this stand is easiest when laid flat! This tip will prevent liquid chalk markers from dripping down the front or on the rubber wood edge. 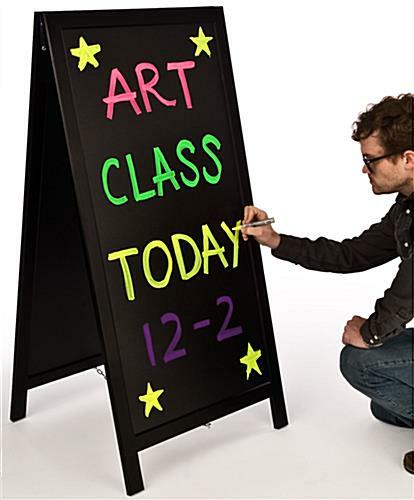 This customizable folding sign, write on a-frame used inside book shops can be positioned near the entrance to display sale information, extended hours or exclusive textbook signings! Customers who have purchased one of these quality stands creatively situate it where the maximum amount of foot traffic occurs daily! Although this menu easel, write on a-frame for curbside advertising is designed for indoor use, only under fair weather conditions can this picture sign be situated outdoors. 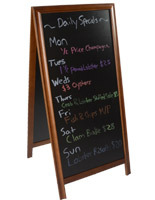 While this sandwich board is mainly used inside retail establishments, this site offers many other affordable chalkboards and dry erase stands that can be used in any location! 23.6" x 48.3" x 24.3"